It’s the second-to-last post in the Spectacular Summer Blog Hop series, and Sue from A Purdy Little House has a lovely idea for a DIY door decoration for this in-between season. It isn’t quite summer and it isn’t quite fall, is it? Her beautiful faux hydrangea door basket would dress up your front door with style – and if you know someone who is in a new home, it would make a great housewarming gift! 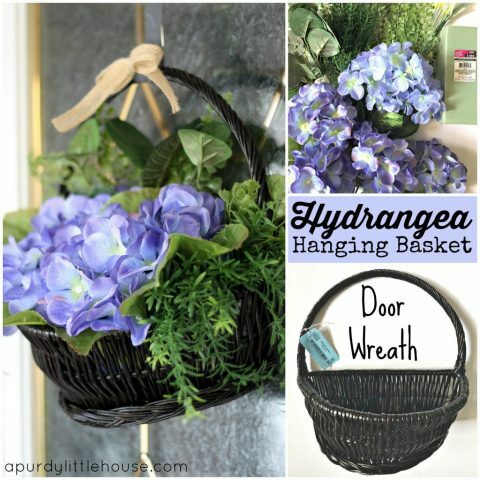 I’m a sucker for blue, so I’m so glad she used gorgeous blue silk hydrangeas for her basket! It has so much country charm to it. Be sure to stop by her blog for the easy-to-follow tutorial and materials list. Don’t miss out on all the #SpectacularSummerBlogHop inspiration!